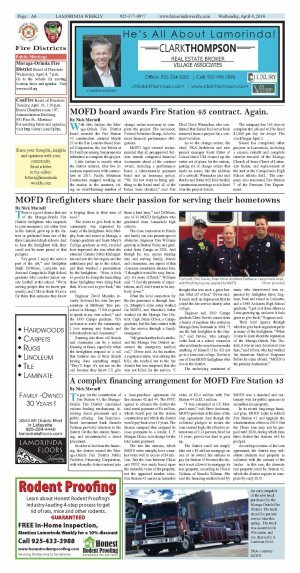 MOFD board awards Fire Station 43 contract. Again. With little fanfare, the Moraga-Orinda Fire District board awarded the Fire Station 43 construction contract March 21 to the San Leandro-based Sausal Corporation, the low bidder at $3.8 million among four proposals submitted to complete the project. Little fanfare is exactly what the district ordered, after two disastrous experiences with contractors in 2017. Pacific Mountain Contractors stopped working on the station in the summer, citing an overwhelming number of change orders necessary to complete the project. The successor, Federal Solutions Group, failed to meet financial performance obligations. MOFD legal counsel recommended that all preapproved bidders furnish completed financial documents ahead of the contract award, including a performance bond, a labor-material payment bond and an insurance policy. "We did not want to bring anything to the board until all of the boxes were checked," said Fire Chief Dave Winnacker, who confirmed that Sausal had never been removed from a project for a contract violation. As to the change orders, the chief, SKA Architects and new project manager Scott Ritter of Consolidated CM cleaned up the entire set of plans for the station, getting rid of change orders that made no sense, like the addition of a catwalk. Winnacker also said that he and Ritter will hold weekly construction meetings to ride herd over the project details. The company has 365 days to complete the job and will be fined $1,000 per day for delays. The clock began April 2. Sausal has completed other projects in Lamorinda, including a seismic retrofit and complete interior remodel of the Moraga Church of Jesus Christ of Latter-day Saints, and replacement of the turf at the Campolindo High School athletic field. The company also renovated Fire Station 7 of the Fremont Fire Department.